I know this is late, so what? 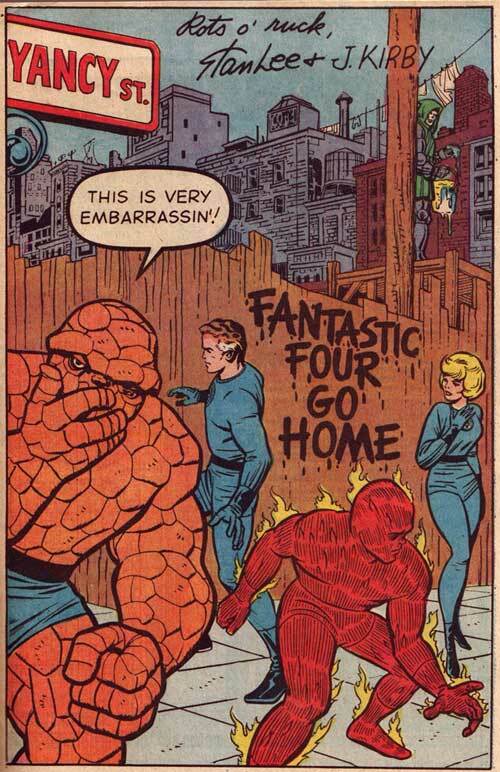 Last week was the fiftieth anniversary of the Fantastic Four’s debut! Hooray! Here’s a pinup by Jack Kirby featuring the Fantastic Four back in the Thing’s old neighborhood on Yancy Street. And as usual, it’s a bad experience. You can see Dr. Doom up in the right corner, and he’s responsible for the welcoming graffiti. Happy anniversary! I realize I’m a bit late with this one, but it’s a fun splash page from Uncanny X-Men #268 by Jim Lee. 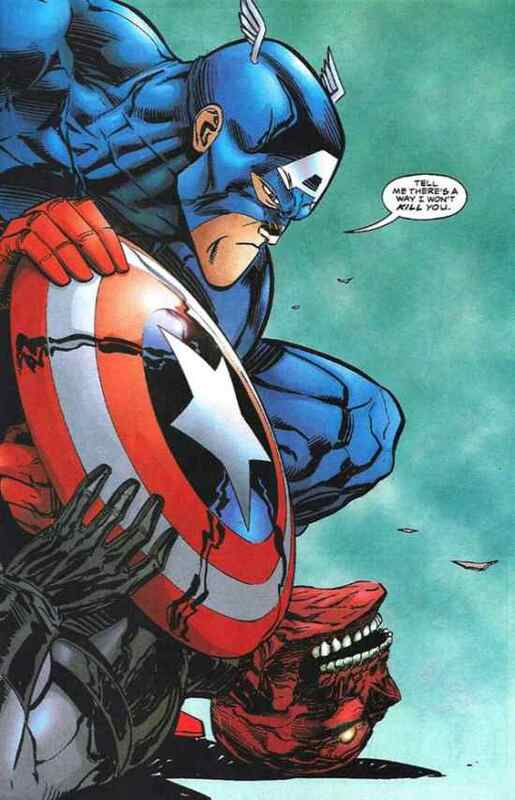 This has become an iconic depiction of Cap. They’ve used this image for t-shirts, posters, covers, you name it. With the Captain America movie that just came out, they’ve even used it as a reference for some of the movie merchandise. Don’t believe me? Check out this birthday set. Clearly a homage to this image. 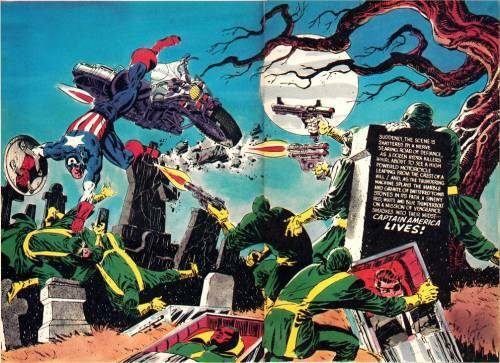 Continuing with all of the Captain America hoopla, we’re going to look at this piece by Jack Kirby. 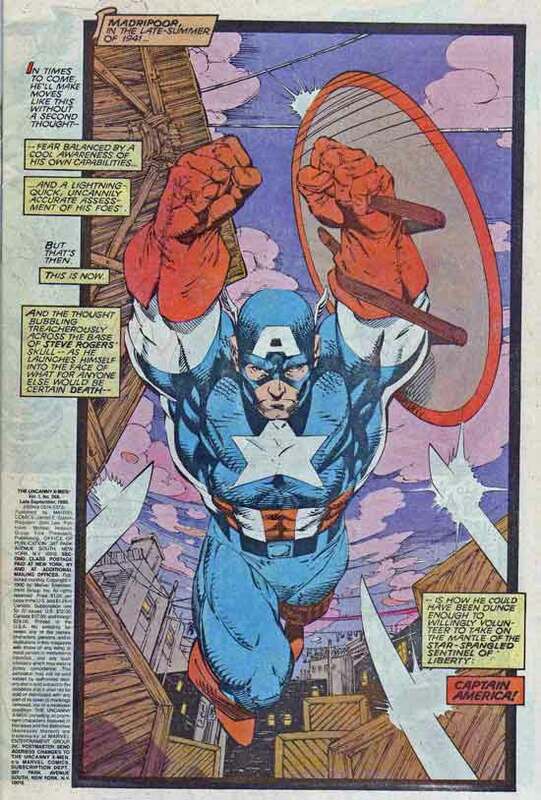 It’s the back page of Captain America’s Bicentennial Battles, which we just talked about the other day. Cap and Uncle Sam are celebrating the bicentennial with a big old cape. This is great 70s Kirby; just look at the Kirby Krackles! Anyway, It’s record breaking hot here in New Jersey so I’m going to go back in the pool. Everyone have a good night! Did you remember that Darick Robertson, who has been lighting up the comics world with Garth Ennis on The Boys, used to do Justice League Europe back in the day? 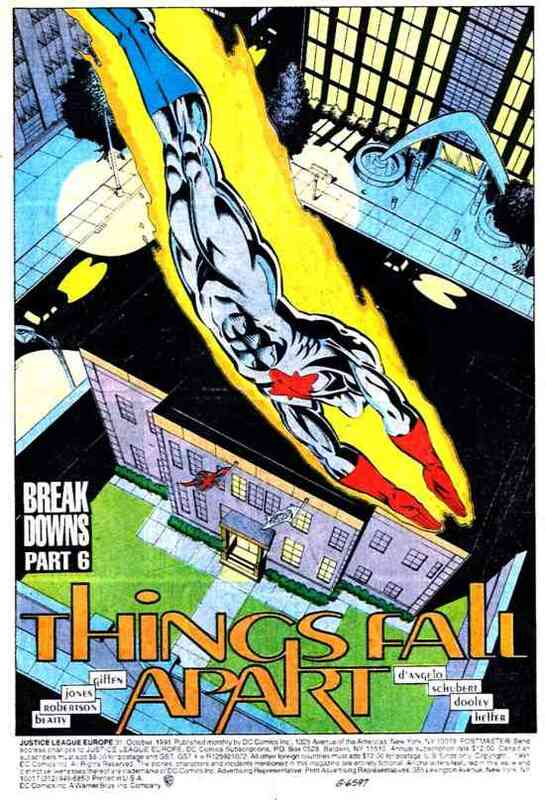 Here’s an awesome splash page of Captain Atom flying into the embassy. 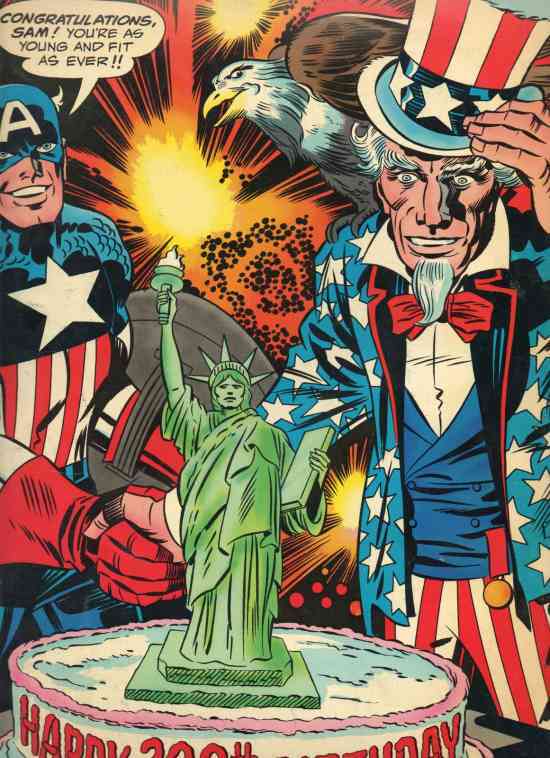 Keeping with the theme of Independence Day, this wee’s splash page comes Captain America #113 by Jim Steranko. It’s a really kinetic double page spread, with Cap fighting off a bunch of Hydra agents who are seemingly digging up Nick Fury and the Vision. There’s a whole lot going on in this page in the malaise. There are Hydra goons flying everywhere. Look at the headstones in the back that are getting smashed. On the right side of the panel, Sterano uses the shadowy back of a tombstone as a text box. Very Eisner-esque. And get a load of those guns! They look straight out of a Fourth World story! Paying tribute to the late Gene Colan, this week’s slash page comes from Dr. Strange #177. Colan had the chance to design a new costume for he good doctor , thanks to villain Asmodeus taking over his body in the story. Dr. Strange creates a new physical form when he returns from the supernatural dimension. 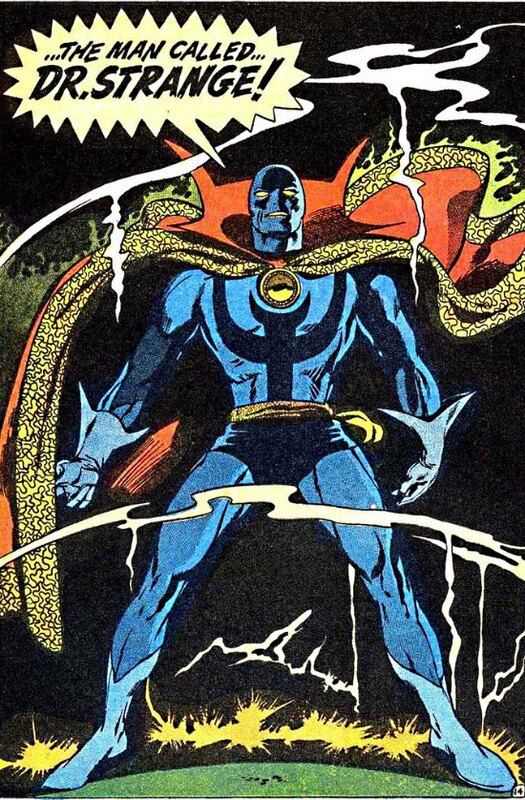 This page is its big debut, and its a lot more super hero-ish when you compare it to Strange’s classic poofy shirt outfit.The costume is very sleek, with the mask completely covering his face except for the eyes and mouth. 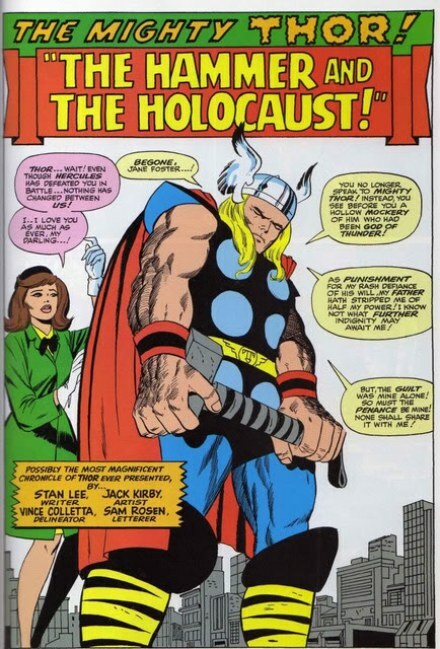 I wonder if this costume had any influence on Jack Kirby’s design of Mr. Miracle, who dresses very similar. This costume was an attempt at revamping the title, which was suffering from low sales. Dr. Strange wound up being cancelled in issue 183, which hit newsstands in November 1969. Colan’s work on this is really awesome (dare I say ridiculously awesome?). Strange looks like he can beat the tar out of you, as opposed to his usual crazy wizard appearance. The negative space around the figure really makes him pop from the background, with the flares and lightning only emphasizing his power. One of the greatest running features on Mike Sterling’s great comic blog Progressive Ruin was the Sluggo Saturday posts that gave us a glimpse into the inner working of Nancy’s best friend. This series inspired me to do Splash Page Saturdays where we will examine splash pages. This week’s installment continues the trend of Green Lantern posts with an example from Green Lantern Corp #43 by Patrick Gleason. 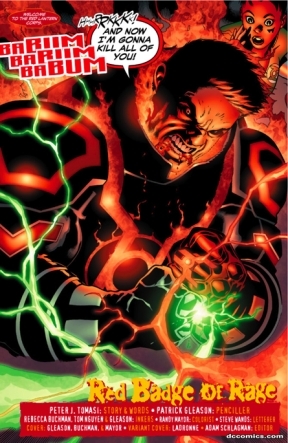 The page shows an irate Guy Gardner powering himself up with a Red Lantern ring. Combined with his Green Lantern ring, Guy is ready to unleash the powers of Christmas on evil-doers everywhere. When I do my workshops on comic books, this is my go-to example on what a splash page is and why they work in comics. Kirby and Sinnot do such a great job of conveying emotion in this piece, so much that it sets the tone for the rest of the issue even if the viewer never ever reads it. Thing’s face is so depressed and dejected, with his brow and mouth drooped in sorrow. Even the way the rest of his body is, shoulders and arms shrugged just make him look so sad. The minimal background really helps (somewhere Vince Colletta smiles). The even linework on the falling rain creates a sense of motion that the whole world is moving and not thing. I find this page so impactful because it tells a whole story. Even the large text bubble “THIS MAN! THIS MONSTER!” drives the desperation home. 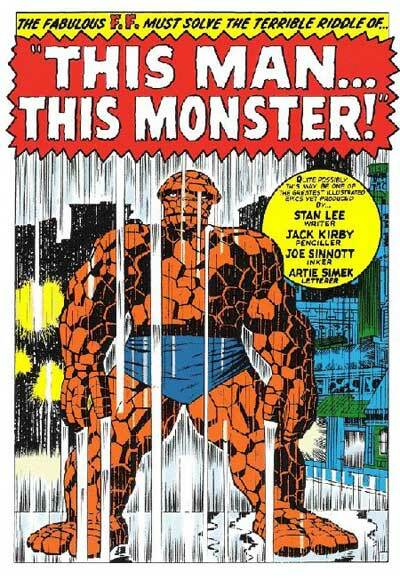 Just seeing this picture makes you want to hug Ben Grimm.